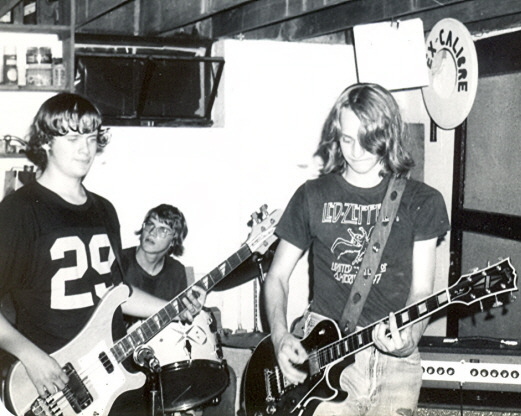 Ex-Calibre, two years after: Steve, Terrell, Kier; reunion jam, 8/21/77, Kier's basement. The Les Paul Kier is playing might be Terrell's. Note Kier's T-shirt: the 1977 Led Zeppelin tour T-shirt is popular again today, but here it is, worn by an actual attendee (at the Capital Centre in Landover, MD). The photo may have been taken by Kier's uncle Carlos.